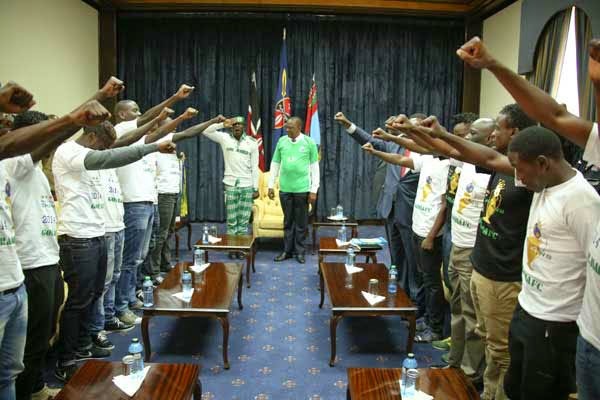 President Uhuru Kenyatta hosted 14-time Kenyan Premier League champions Gor Mahia to a luncheon at State House in Nairobi, on Friday. During the function attended by Gor Mahia’s playing unit and officials, the President said the Government is keen on developing sports in the country, noting that the State has already taken steps towards this. Uhuru asked security agencies to come up with a strategy to eradicate hooliganism in sports, saying increased cases of violence by a section of fans, especially in football stadiums, was slowing down the gains made. “All negative elements that tarnish the game must be removed. I am sure if we stop hooliganism, football clubs will attract even more sponsors from the corporate world,” Uhuru said. Kenyan Premier League matches have in the last few months been hit by hooliganism, leading to loss of property. Uhuru also addressed the issue of funding in local sports, saying the Government will speed up the establishment of a national sports lottery to support sports teams and local sports activities. The President, clad in a Gor Mahia jersey, congratulated the players during a closed-door session and gave out Sh3 million to the team of which Sh1 million will be shared by the players. The playing unit, led by captain Fredrick Onyango, team manager Jolawi Obondo, chairman Ambrose Rachier and renowned fan Jared Abong’o aka Jaro Soja also posed for a photo shoot with the President. “We had a wonderful time at State House today. The President has really motivated and rewarded us all with Sh28,000 each on top of serving us with food and drinks. He assured us that the Government is working on several issues to improve the standard of football in the country,” Onyango said. Gor Mahia clinched an unprecedented 14th KPL title last week after a 3-0 win over Ushuru at Moi Stadium in Kisumu. The team will represent Kenya in next year’s African Champions League tournament.